Hello again, Christmas is rapidly approaching isn't it. I hope preparations are well in hand, unlike mine this year. Its going to be a last minute rush again. Will I never learn. 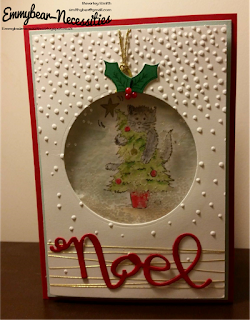 The card I'm sharing today is made to look like a bauble, using a circle I confess, the image I coloured in is not SU, it's by Penny Black - and so like my cat, Star. I haven't put the tree up this year as she has a habit of climbing up curtains, plants etc. I can imagine I'd come home to a real Star on top of the tree each evening. ...I'm sure you can guess what I've done in the past. !